Cassini acquired this view of Titan on April 13, 2007, following a flyby of the Mercury-sized moon. 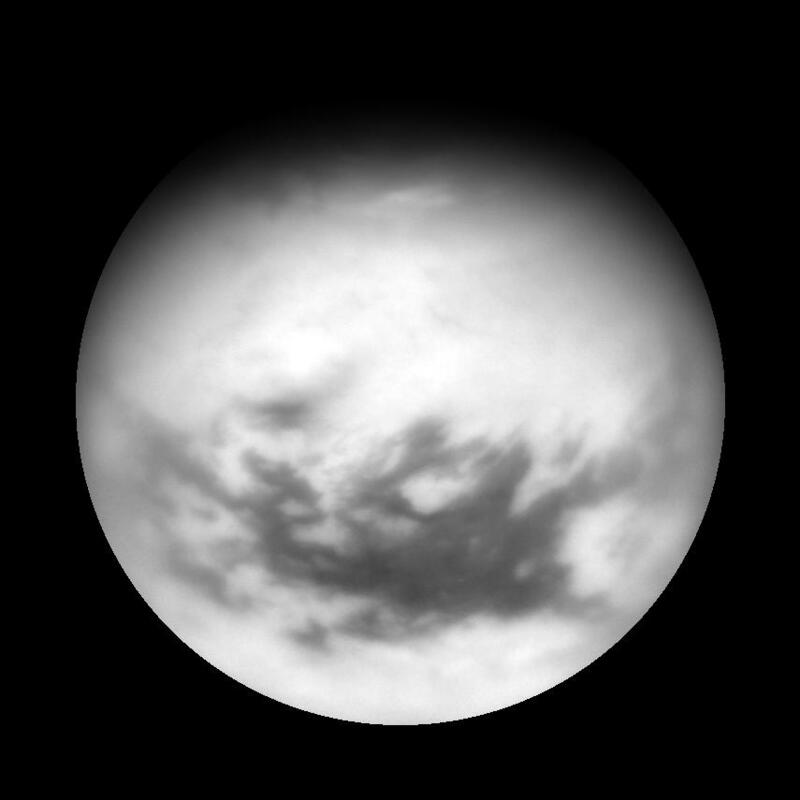 Titan's equatorial dark regions are visible in this view, along with faint, dark lineaments (linear features) in the otherwise bland-looking terrain of the north. Near the terminator are the dark, lake-like features identified in Cassini flybys early in 2007 (see PIA08365 ). To the east of the lake-like features is a bright patch of clouds that likely consist of a mixture of methane and ethane. This view of Titan (5,150 kilometers, or 3,200 miles across) is an orthographic reprojection centered on 27.4 degrees north latitude. An orthographic view is most like the view seen by a distant observer looking through a telescope. The view was obtained using a filter sensitive to near-infrared light centered at 939 nanometers, allowing for observations of Titan's surface and lower atmosphere, added together. An image taken using a filter sensitive to visible light centered at 619 nanometers was then subtracted from the product, effectively removing the lower atmosphere contribution to the brightness values in the image, increasing image contrast and improving the visibility of surface features. The Cassini spacecraft acquired this view with its narrow-angle camera at a distance of approximately 1.2 million kilometers (800,000 miles) from Titan. Image scale is 7 kilometers (5 miles) per pixel.